On June 13th community members from Humberlea gathered at St. Simon School. The meeting was organized to enhance discussions on safety and community issues, as well as the creation of a new Neighbourhood Watch program. Attendance was high, and included Ward 7 Councillor Giorgio Mammoliti, 31 Division Inspector Colin Greenway, 31 Division Crime Prevention/Community Relations Officer Constable Jenn Rai, 31 Division Parking Enforcement and Bylaw Officers, local OPP Officers and City of Toronto Community Development Officer Rosa Ann Bailey. The focus of the meeting raised awareness and addressed the current crime and safety issues affecting Humberlea. It also created an opportunity for everyone to engage with each other, and the local officials, to discuss and learn how to execute effective solutions to the issues impacting Humberlea and discuss the creation of a Neighbourhood Watch. Factors discussed included incident reporting as well as effective prevention and security measures. Those in attendance discussed safety issues and offered suggestions for improvements to the area. Inspector Greenaway started the meeting by congratulating the Humberlea residents on their community and its low crime statistics. Greenaway said that while Humberlea encompasses 25 percent of the 31 Division area, it only attributes to five percent of the total crime. He felt the area was one of the best in Toronto. 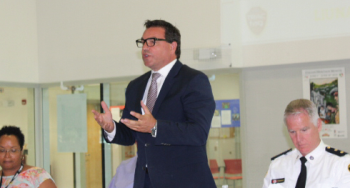 Councillor Mammoliti answered questions on everything from illegal dumping, traffic and speeding, to homeless squatters, suspected drug or crack houses, and late night parties on public property. The Councillor said police staffing numbers in the area are down approximately 50 officers due to the new police plan initiated by the City and Mammoliti reiterated his support for a higher police presence reflective of staffing levels that were in place just a few years ago. A Neighbourhood Watch meeting will be held on Thursday, August 16th at 7 p.m. The meeting will take place at 31 Division. In order to qualify for the program, there needs to be at least 50 per cent buy in from residents on each street involved. 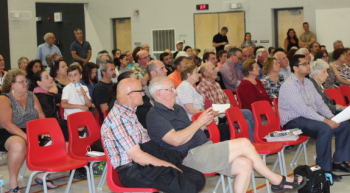 Although this meeting garnered a few more registrations, it is not nearly enough yet to qualify towards a Neighbourhood Watch program. More volunteers from each area are required to go out and canvass before levels are high enough for the CPTED audit to facilitate interested parties to go forward with the meeting.